Panasonic has added two models of full HD fixed domes to its line, promising the highest resolutions and framerates of any Panasonic dome. In this note, we examine these cameras' featuresets and compare to options from Axis and Sony. 30 FPS specified at maximum resolution, 1080p. High profile H.264, which may provide bandwidth and storage savings over baseline and main profile cameras, as well as MJPEG and MPEG-4 streaming. The key difference between these two models is day/night capability. While the WV-SW559 uses a removable IR cut filter, the WV-SW558 is electrical day/night. Users should be aware of this, as it will affect nighttime image quality, visible noise, and low-light performance. Compared to the current NW502, which the SW559 replaces, many specifications remain unchanged. Both are capable of 1080p resolution, though the NW502 supports only 15 FPS, instead of 30, at this resolution. Additionally, the SW559 uses a CMOS sensor instead of CCD, and is specified as more sensitive (0.5lx color/0.06lx B&W vs. 2lx/.16lx). Both of these models are available now. The SW558 has an MSRP of $1,310 USD, and an estimated street price around $950. The SW559 has an MSRP of $1,690, with an estimated street price around $1,200. Street prices are best on available models' MSRP and online pricing. The SW559's street pricing puts it in the range of the Axis P3346-VE (~$1,200 online) and moderately lower than the Sony SNCDH280 (~$1,400 online), two popular outdoor dome options. 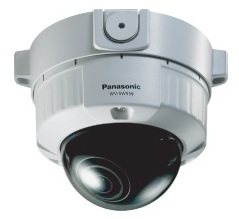 Both are outdoor, vandal-resistant 1080p fixed domes, capable of up to 30 FPS at max resolution. There are some key differences between these options. Among these, the SW559 is the only camera which offers high profile H.264, which may offer moderate bandwidth and storage savings compared to others. While all of these options feature remote back focus capability, both Axis and Sony are also capable of remote zoom. Additionally, Panasonic and Sony both claim WDR performance, while Axis does not. Finally, Sony's DH280 features built-in IR illumination, which accounts for some of its higher cost.